Not a bad second installment to the series. 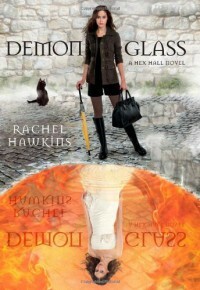 :)This time we follow Sophie Mercer as she she leaves Hex Hall to spend time with her father in England. A few new characters are introduced, and we get to meet up with the mysterious Archer Cross again, Sophie's love interest-turned enemy.Not everything is as it seems with the Prodigium. Who can be trusted? Who can't be trusted? Is the enemy truly the enemy, or just misunderstood? There are many questions to be asked, and only few to be answered. Book 2 ends on one of the famous YA cliffhangers, but I'm learning to roll with them by this point. It's just the nature of the beast, leaving us hungry to find out what will happen next.There was still a fun element to this sequel, and plenty of snarky humor throughout. Some of the one liners felt a bit more forced this time around, but Hawkins still threw in some zingers that made me smile. I like her easy, breezy writing style. Not much about these books feel serious, even when danger is supposedly lurking near, but to be honest, that never bothered me. I asked for fun with this book and I got it.